India’s first 3G Mobile Service operator Mahanagar Telehone Nigam Ltd (MTNL) announced the launch 3G-driven Mobile TV services which work with 3G Mobile Internet on browsers, as well as through video calling just like Dial A TV. 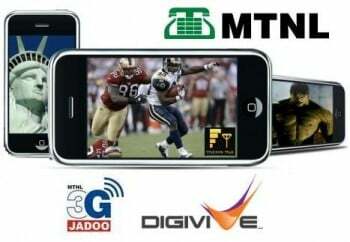 MTNL entered into a partnership with content provider DigiVive to offer new 3G Mobile TV, VoD (nexGTV) and 3G Video IVR services (Vmotion). The new 3G Mobile TV service, uniquely offered by MTNL to its 3G mobile subscribers in Delhi and Mumbai circle. The Dial a TV – “Vmotion” service would be available on a Daily Rs.3, Weekly- Rs.10 and Monthly Rs.60 as subscription charges without any Video Call charges over short code 52627 (presently available in Delhi circle). While nexGTv – 3G Mobile TV via Internet Browser will cost at Rs 99 per month, Rs 35 per week and Rs 8 per day, without any hidden or additional 3G data/GPRS charges. The nexGTv is a mobile TV service offering more than 50 Live TV channels from Entertainment, Reality, News, Religious to Popular Regional Channels and an exhaustive list of Video-On-Demand (VOD) content on mobile phone.The new partnership also further cements DigiVive’s role in the development of new advanced mobile services for MTNL and of 3G in India. Kindly tell us the channel names, are they included Sony max, Marathi channels? Or just added unwanted 20 DD Channels?